Africa U.S.A. - Animals of Africa U.S.A.
Africa U.S.A had over 20 different types of African animals. Each type is described below. Click on the links on the left to learn more about Africa's endangered species and links to popular theme parks featuring African Animals. Abyssinian Asses - The small, docile donkey like animal, made famous as the animal Jesus rode into Jerusalem. Aoudad - Also known as the Barbary Sheep from Northern Africa famous for their long backward curving horns. Baboon - A primate of East Africa, are very social and like to interact with humans. Click here for more information about baboons from the African Wildlife Foundation. Camels - These ancient beasts of burden were Dromedary Camels.  They are most commonly found in Northern Africa. Cheetah - This elegant and graceful member of the cat family was very popular at Africa U.S.A. Mojah and Mbili, which means "One" and "Two" in swahili, were tame house pets. Click here for more information about cheetahs from the African Wildlife Foundation. Chimpanzee - Many chimpanzees lived at Africa U.S.A., most famous of which was Princess Margaret. Click here to learn more about chimpanzees from the African Wildlife Foundation. Eland - This cow-like creature is actually the largest antelope in the world. 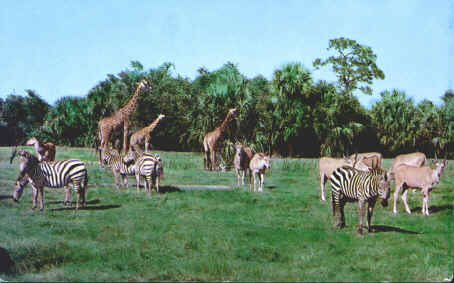 Africa U.S.A. owner John Pedersen had hoped that eland would be as common as cows in Florida. Click here to learn more about eland from the African Wildlife Foundation. Elephant - The elephants at Africa U.S.A. were actually Asian elephants rescued from circuses. Click here to learn more about elephants from the African Wildlife Foundation. Gazelle - The most common gazelle in East Africa, Thomson's gazelle were a common site in Africa U.S.A. Click here to learn more about Thomson's Gazelle from the African Wildlife Foundation. Giraffe - These tall elegant, friendly creatures are really a sight to behold. Africa U.S.A. had many giraffe, including Champ. Click here to learn more about giraffes from the African Wildlife Foundation. Gnu - Also known as wildebeest, they are in the antelope family. Two of the gnus were named "Good Gnus" and "Bad Gnus." Click here for more information about wildebeest from the African Wildlife Foundation. African Gray Crowned Crane - Native to South Africa, these beautiful cranes have a golden crest or crown. They were part of the original animal shipment from Africa. Manatee - These aquatic mammals, also called "sea cows" are still frequently found in the Hillsborough Canal. Monkeys - The monkeys at Africa U.S.A. were located on monkey island. A variety of South American monkeys such as capuchin monkeys lived many years in the area long after Africa U.S.A. was closed. Nilgai - Also called the Bluebuck, this member of the cattle family is native to Southeast Asia. Nyala - These members of the cattle family are from Southern Africa and are grazing animals. Ostrich - These tall birds produced eggs that were sold commercially throughout the United States. Native to Central Africa, ostrich can achieve a height of 12 feet. Peacocks - These beautiful multi-color birds were a common site at Africa U.S.A. After the attraction closed the peacocks still roamed the area and the Camino Gardens neighborhood placed colorful "Peacock Crossing" signs through the area. Sitatunga - The sitatunga is an amphibious antelope that lives in Kenya and Tanzania. Click here for more information on sitatunga from the African Wildlife Foundation. Zebra - These familar striped members of the horse family were an extra special attraction at Africa U.S.A. Two species of zebra were featured. 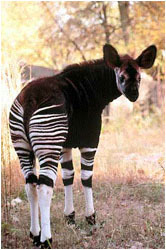 Chapman's zebra or the common zebra were featured along with the larger Grevey's zebra. Almost extinct in the wild, Grevey's zebra have much finer stripes and a white underbelly to distinguish them from Chapman's zebra. Click here for more information on zebras from the African Wildlife Foundation. Zee-Horse - "Tiger" the Zee-Horse had a zebra father and an English racehorse mother. This unique one-of-a-kind creature was a popular Africa U.S.A. attraction. Click here to read about the recent birth of a zee-horse in England.